I have reported on several digital cameras in the past, and I was always fascinated by “face recognition software”, which is somehow able to pluck faces out of any pictures and make them clearer. I don’t know how a computer could even recognize a face, much clear it up. 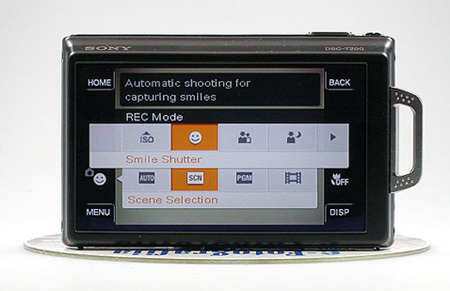 To make things even more complicated, Sony has developed a camera that has “smile recognition software”. Once again, I have no idea how a computer, especially one that can fit on a portable digital camera could possibly recognize what a smile could look like. However, the user of this camera has the option of using this feature. Once the camera sees the smile, the shutter clicks. Now, let’s make this equation as complex as you can get it, a user can adjust the shutter to detect degrees of smiles. For example, a user set sensitivity to low for the detection of the smile after a big laugh, or high for a non-hostile smirk. You can also adjust for Mr. In-Between. Before I turn these latest breakthroughs over to the realm of “unbelievable”, I would like to call to the stand Exhibit A, a YouTube video of this smile-detecting camera in action. True it is in Japanese, and could just be one big fraud, but if a camera can detect a face, why not a smile? Let’s just say it is true. I suppose that means that we would never have any more pictures where someone is not smiling. Although in the age of digital cameras, I hardly see that as a problem. Just hit delete and take another one. Still, if this camera can save us those seconds, perhaps it is worth it. A bit of advice on the use of this camera. Use the lowest setting possible when taking a picture of the Joker.